Clever and deceptive photoshops are one of the best ways to invent a fake tank. There are at least three reported “T-34(r) mit 8.8cm” tanks, all in German service. 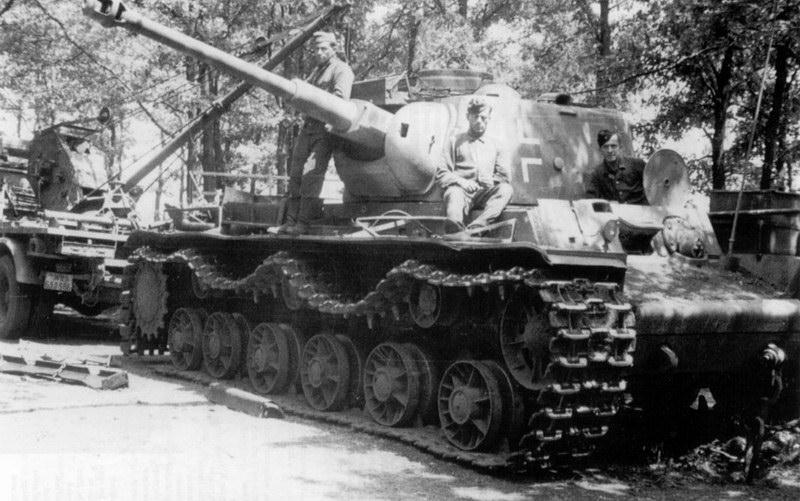 The first is rather popular – a captured T-34 with a Flak 88 mounted on top – the “T-34(r) mit 8.8cm Flak“. The second vehicle is a T-34/85 with a barrel reamed to fire 8.8cm shells – the “T-34(r) mit 8.8cm (85mm Aufgehbort)“. The third is a T-34/85 rearmed with a Tiger’s 8.8cm gun – the “T-34(r) mit 8.8cm KwK 36 L/56“. It appears as though the T-34(r) mit 8.8cm KwK 36 L/56 and the T-34(r) 8.8cm Aufgehbort were inspired by the same source – an interview with a former German tank commander. The Flak 88 version appears to have developed from a different source – a modelling magazine. Whilst the Flak version never existed, and the KwK 36 variant probably didn’t exist either, the reamed version seems slightly more plausible, although the concept is still riddled with problems. This first version easily attracts the attention of modellers and tank fans alike. The idea is simple – a captured T-34 with a Flak 88 mounted on top to make an SPG. The only given history for this vehicle seems to come from Henk of Holland, a well-respected modeller. He states “This vehicle was in service with the battle group ‘Kienast’, and was used during the last battle in April 1945 in East-Sachsen [Saxony]”, although he does go on to remind us that the vehicle is fake. This battle group appears to be made up, and Henk of Holland may have obtained this information from a now-defunct internet source that cannot be traced any further. In terms of combat, this vehicle could take on many different roles. 1. Tank Destroyer. We need only look at the well-decorated history of the Flak 88 from as early as the Spanish Civil War up until the final days of fighting in Berlin. It is almost certain that the T-34(r) mit Flak 88 would see service against the Red Army, and they knew that the T-34 and even the fearsome KV-1 could be destroyed by the Flak 88, even from long ranges. The Flak 88 was one of the most deadly and versatile artillery pieces of its time. For AT duties, its accuracy and power were realistically only matched by the Firefly’s 17-pounder gun and the Soviet 100mm BS-3 M1944 gun in the late war. The Flak 88 had a staggering effective range of just under 15,000 meters! It would simply be out of range of most enemy guns, whilst it could easily fire upon them. Apart from which, it was even given a telescopic sight for engaging ground targets, which meant that direct long range fire was done with ease. In the Battle of France, the Flak 88 managed to destroy 152 tanks, including the Matilda II and Char B1, which the 3.7cm AT guns could not. By mounting the Flak 88 on a captured chassis, the users would have had a superb Tank Destroyer, because it would be able to quickly relocate (owing to the T-34’s rugged and reliable chassis), but deliver a knock-out blow with each shot. The Flak 88 was actually the basis for the universally-feared 8.8cm KwK 36 gun as mounted on the Tiger! The Flak 88 also had a more than agreeable gun elevation: -3 to 85 degrees, which would allow it to adopt many different firing positions, not dictated by the evenness of the ground. 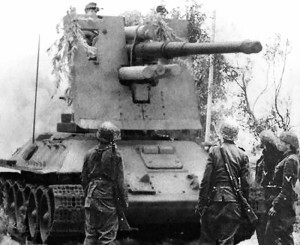 However, it must be noted that the Flak 88 even not mounted on a vehicle was often too tall to be camouflaged effectively, now atop a T-34 chassis, the vehicle would be approximately 18 feet tall giving it a huge profile – to put this into perspective, the Tiger was only 9 feet 10 inches tall. 2. Bunker destroyer. The Flak 88 saw prolific use mounted on vehicles at the Battle of France, with the Sd.Kfz. 8 heavy tractor – the “Bunkerknacker”. Throughout the battle, the Flak 88 reportedly destroyed 151 bunkers, thus meaning that perhaps the T-34(r) mit Flak 88 could do the same job. However, the lack of protection for the crew would be problematic and could lead to casualties. Also, the T-34’s hull would not be able to take heavy punishment if it were to come up against an AT gun or any other tank that the USSR could field (excluding some lighter vehicles) at close quarters. Therefore, it may not be best suited to this role, but could certainly do so if needs be. 3. SPAAG. The Flak 88, whilst possibly better known for its anti-tank role, was originally an anti-aircraft gun. It was only turned on tanks when the 3.7cm guns were found unsatisfactory at engaging certain heavily armored tanks. However, overall it may not be worthwhile using the vehicle as a SPAAG, as the Flak 88 had a rather limited firing ceiling of just under 8000m, which meant that many aircraft could fly above this range. Seeing as though it would likely only fight against Soviet aircraft, it would be able to engage the most produced aircraft that the USSR had – the IL-2 with its maximum service ceiling of 5500m, although the Yak-9 (the second most numerous Soviet aircraft during the war) had a maximum service ceiling of 9100m, which would put it out of range in theory, although they often operated below this. Having said this, the effectiveness of anti-aircraft guns can, and was, called into question during the war, and it may not be worth using the vehicle for this role. General problems with this vehicle would be apparent. Firstly, the gun arc would be problematic. The fact is that the T-34 chassis would not necessarily be wide enough to allow the crew manning the Flak 88 to turn the gun too far to one side, unless they welded on a platform on which to stand and operate the gun from. Standing on the T-34’s sloped sides would be a dangerous and tricky affair when handling artillery shells. The Flak 88 is a little under 8 ft (excluding the barrel), and the T-34’s chassis is only 9ft, so there would be little space for the crew to operate the gun in. Secondly, there would also be little space to stow munitions. As seen on a scale model, it would be likely that munitions would be stowed on deck, but this can be dangerous, as they could be hit and would explode directly next to or on top of the engine compartment. It is also important to note that by doing this, there would be no space for external fuel tanks, thus significantly reducing the range of the vehicle. Thirdly, the crew would be vulnerable to small arms fire. Despite a large gunshield on front, as with any open-cabin vehicle, enemy snipers or heavy machine guns (such as the DShK) would have little trouble making quick work of the crew, thus rendering the vehicle near useless. This is actually very important because the crew being killed by simple small arms fire is a significant risk to the overall capabilities of the vehicle, and therefore its usefulness as a viable weapon come in to question. 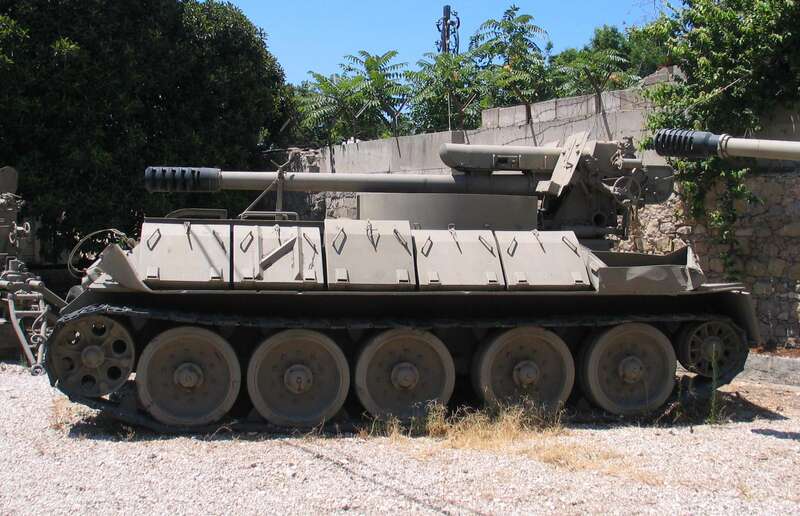 For example, many loaders of the American M58 Ontos were killed by enemy small arms fire when reloading the external recoiless rifles. Similarly, crews of the SU-76 were incredibly vulnerable in urban combat, so good teamwork with infantry to support the tank was needed to avoid crew casualties. Finally, the Flak 88 actually weighs roughly 1.4 tons less than a common early model T-34/85 turret (with an S-53 gun), but this weight would be heavily concentrated near the front of the vehicle, making it very nose heavy. This could stress the chassis in one particular area of the vehicle instead of giving more even distribution as with a turret. Also, top speed might be slightly lower as a result of the wind resistance from the enormous flat gunshield, but the lowered weight might roughly compensate for this. However, the bigger problem would be the center of mass being raised on the vehicle. The Flak 88 was normally fired from a secure and wide ground mount, thus the vehicle might be prone to toppling into ditches, or wobbling when firing as a result of the recoil, thus impairing aiming. This could be particularly dangerous to the crew if engaging multiple targets which are within range of returning fire, meaning that the effective rounds per minute is decreased. Overall, the T-34(r) mit 8.8cm Flak would be comparable to the Nashorn (Sd.Kfz. 164), with its 8.8cm Pak 43/1 (a gun designed by Krupp in competition with the Flak 41), generally similar construction, and similar likely roles. 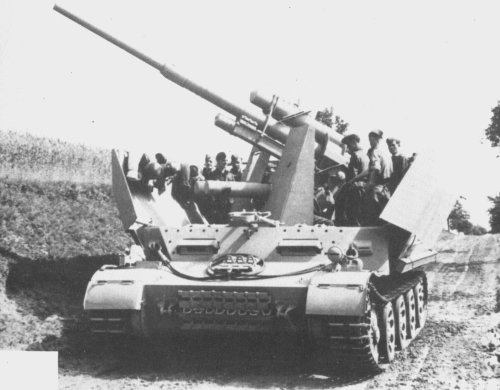 Of course, the Nashorn would have had one major advantage over the T-34(r) mit 8.8cm Flak, which is that it had all around protection for its crew, except for the roof. The Nashorn had a very high profile – 8ft 8in, but the T-34(r) mit 8.8cm Flak would be, as mentioned, 18 ft tall, meaning that the vehicle would be incredibly conspicuous. In fact, Nashorn production was cancelled in favor of the Jagdpanzer IV because it had a lower profile and thicker frontal armor, even despite having a less potent 7.5cm gun, so it is clear that unlike the USSR, which favored mounting the biggest guns available, Germany would favor vehicles which can be used for ambush attacks, as part of their overall defensive campaign during the late war. This fake tank came about as a result of a single photoshop showing a T-34 chassis mounting a Flak 88 instead of a turret. This is actually a very plausible vehicle on numerous levels. Firstly, the Germans did mount Flak 88s on their own vehicles – such as on Panzer IVs, or on prime movers, such as the Sd.Kfz 8, in large numbers. 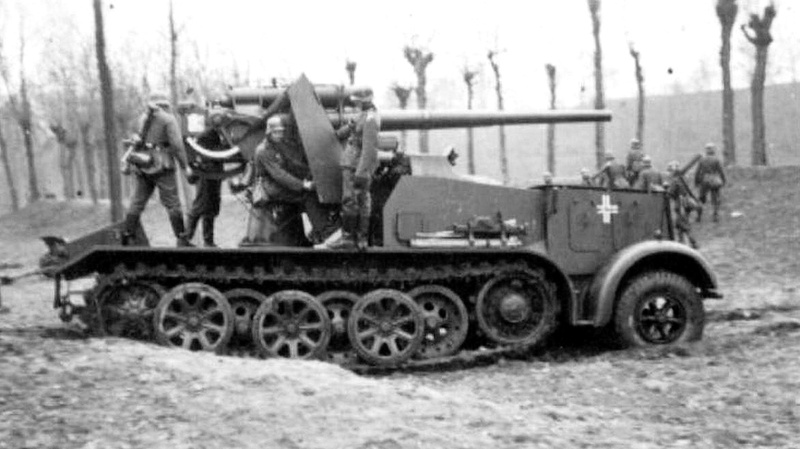 Secondly, the Germans were known to mount weapons on captured vehicles in a similar manner – for example, some captured T-20 Komsomolets were modified to carry a 3.7cm Pak 35/36, a concept as seen first with the Soviet ZiS-30. Finally, after WWII, a lot of countries that used the T-34 made similar modifications – for example, the Cubans mounted a 122mm gun on a T-34/85, after cutting away some of the turret, the Syrians mounted a 122mm on a T-34 chassis by reversing the hull, and the Egyptians even made a new superstructure to fit a 122mm gun, these three designs thus showing that a modification of a T-34 into a self-propelled gun was more than possible. However, one thing must be noted about the D-30 122mm gun – it weighed less than half of the Flak 88, in fact, it was a staggering 4.6 tons less! Whilst the D-30 was 34mm larger than the Flak 88, it was also 18 calibers smaller, and apart from which, it was a much simpler gun. Weight is particularly important when considering possible modifications to the T-34 chassis, as whilst it was a very rugged chassis, it had its limits, and such SPG modifications of the T-34 are perhaps the most the chassis could bare. Similar to the Flak 88 as mounted on a Panzer IV, the chassis would be seriously lowered as a result of the excess weight, and this is evident in photographs. Having said this, the T-34 had a weight load of 15 tons more than the Panzer IV, which might accommodate the Flak 88 with more ease. Since then, it has circulated prolifically across the internet. Often, this vehicle appears on World of Tanks and Warthunder forums, which almost certainly contributed to its popularity. In fact, since the creation of the “waffentrager research line” on World of Tanks, its popularity probably increased even more with fans demanding the companies make this tank in the game. In the last few years, the original photo of the T-34 used for the photoshop has been found and is commonly posted following any mention of the T-34(r) mit Flak 88. The second and third version of the T-34(r) mit 8.8cm appear to be related. This version of this T-34(r) mit 8,8cm was a simple T-34/85 with a gun reamed to 8.8cm from 85mm (probably an S-53 as the D-5T saw limited production). The suggestion of re-boring the barrel to fire 88mm shells sounds dubious. It would be wrong to dismiss Kloth’s story based on the fact that he suggests the Soviets had 87mm guns. He did serve at Kurland, lending some credibility to the story – In 1944, he was transferred to the surrounding areas of Kurland with a Panzerjager unit until May 1945. He is the only source for this story, and this makes it hard to definitively say whether or not this story is true. The only other way to determine whether or not this is true is to consider ballistics. There is a long standing debate on whether or not captured shells of similar or the same caliber can be fired by tanks. It is possible that the S-53 barrel could be rebored to 88mm, assuming that any ships at Courland had the right equipment, as stated in Kloth’s story. However, it is unclear whether or not the Pz.Gr. 39 shell would work in the breech of the modified S-53 gun. There is no firing chamber like with rifles in tank guns. Assuming that the casing of the shell fitted inside such a modified gun, it is possible that it would fire. However, the length and diameter of the shell case, powder charge, and tapering of the neck and shell case might need to match, too. If the shell has too much powder charge, the shell might misfire to varying degrees – It might fire inaccurately, it might blow the breech block apart and damage the gun mechanism. Finally, the ammunition used for the KwK 36 was electrically primed. Normally, shells of higher calibers have a self-contained primer which is ignited using a percussion cap – this is very different to the KwK 36 gun. This single fact means that the reaming of the S-53 gun might not have been enough to make the shells fire. It would require a drastic reworking of the gun with very complex mechanisms. For these reasons, it is almost certain that this vehicle is also a myth. 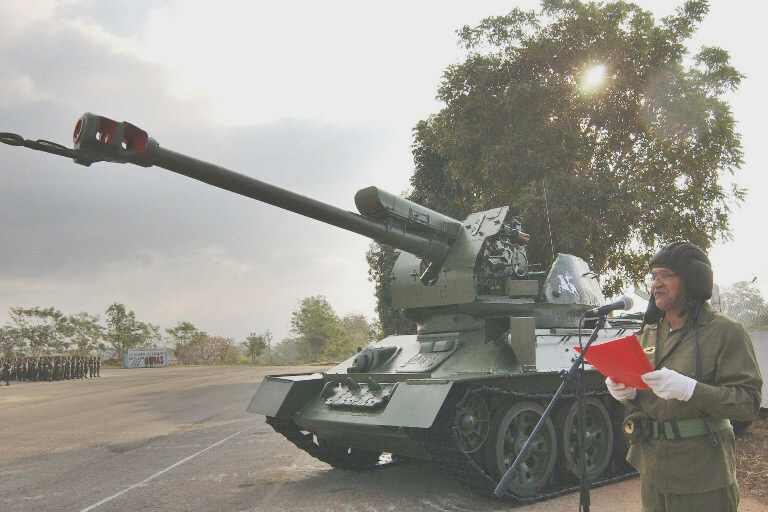 The T-34/85 turret is hardly a likely candidate for holding such a long, heavy gun. It would probably cause the suspension serious problems – it is widely known that the attempts by the Soviet to fit a 100mm gun to the T-34/85 caused the suspension to buckle and break during firing. Secondly, there would have to be extensive and incredibly precise engineering in order to actually fit the huge gun in the T-34’s gun mount (and being able to give it any elevation or depression), something probably not available to any units outside of heavy factories of Germany. Thirdly, the gun itself was huge and complicated. In fact, the KwK 36 L/56 took up most of the internal space for the Tiger I turret. It is extremely unlikely that there would be internal space in a T-34/85 turret in which to accommodate such a large gun. Fitting a new parts to captured Soviet tanks is not uncommon. For example, many early war tanks such as the KV-1, KV-2, and early model T-34s received new commander’s cupolas and headlights. However, fitting a new gun is somewhat more rare. 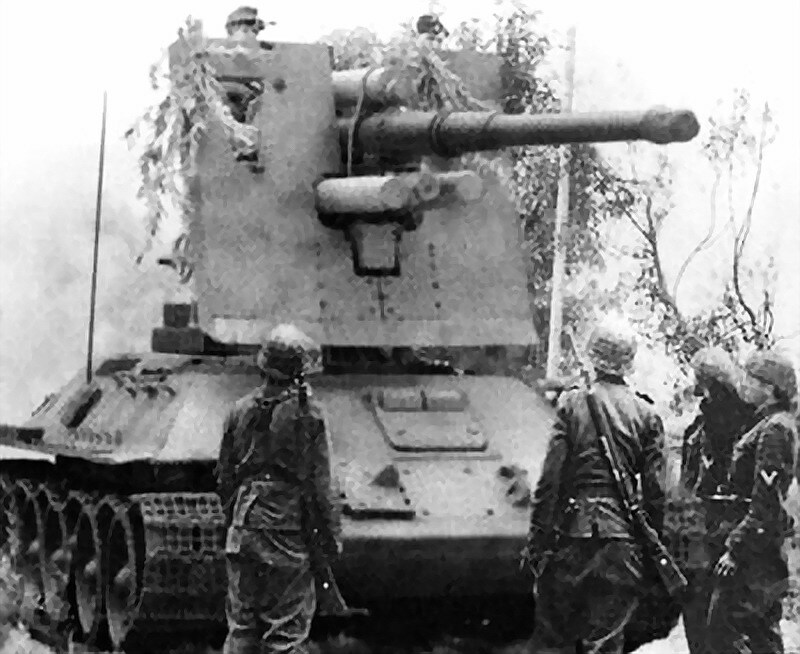 It is known that a 75mm KwK 40 was fitted to a KV-1 and saw action at Kursk, but this seems to be a very rare occurrence, probably owing to the difficulty of the task. This may have inspired this monster T-34 in part. 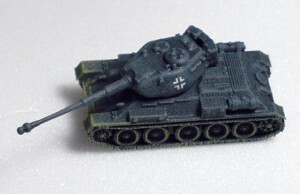 Overall, the vehicle appears to have been inspired by the reamed T-34 that Kloth mentions in his interview. Although he explicitly states that the gun was reamed (that is, rebored), it is obvious that both of the vehicles have the same story, and it is likely that an internet source either misinterpreted the interview, or used it as inspiration for a fantasy vehicle. “US Military Intelligence Report: German Anti-Aircraft Artillery” A US Military Intelligence Service report from 1943. Fair commentary from the Tanks Encylopedia staff was used in the writing of this article. Tanks Encyclopedia’s own rendition of the T-34(r) mit 8.8cm KwK 36 L/56. 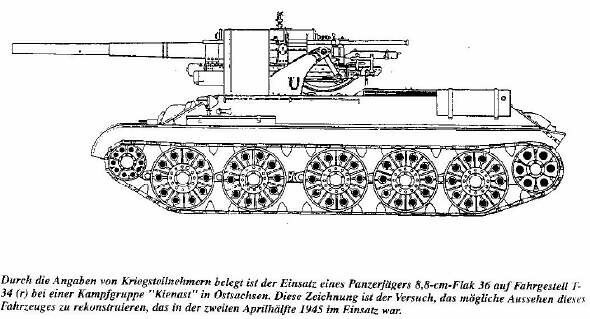 Tanks Encyclopedia’s own rendition of the T-34(r) mit 8.8cm Flak. A typical T-34(r) Beutepanzer. From the outside, it would be impossible to tell if the gun has been reamed to fire 8.8cm shells. A photoshopped image of a T-34(r) mit 8,8cm Flak 88. This is a highly convincing image, and the only immediate giveaway for it being a fake is the fact that the chassis appears remarkably unstressed. Notice how tall the vehicle is compared to the soldiers. It would have a tall profile, making it very difficult to camouflage, and its relatively thin armor (80mm hull, and mere gunshield) would mean that if it were targeted by enemy AT guns, it would most likely be destroyed. This is unlike the KV-2, which, whilst it was a very tall tank, it had the armor to cope with the attention it received. The unphotoshopped T-34/85 before it was given an 8.8cm Flak. From this, we can deduce that the photoshoped image has been shortened, and the soldiers have been somewhat edited. The gun with the muzzle brake on the right has also been mysteriously edited out in the fake image for seemingly no reason. The markings on this vehicle are also unknown, and do not appear on the photoshopped image. A drawing of the T-34(r) mit 8.8cm Flak. The Flak 88 in this drawing appears rather low, and it is possible that the artist has neglected how the gun actually works. Certain controls, such as the elevation crank would be difficult to operate by the crew, given this layout. 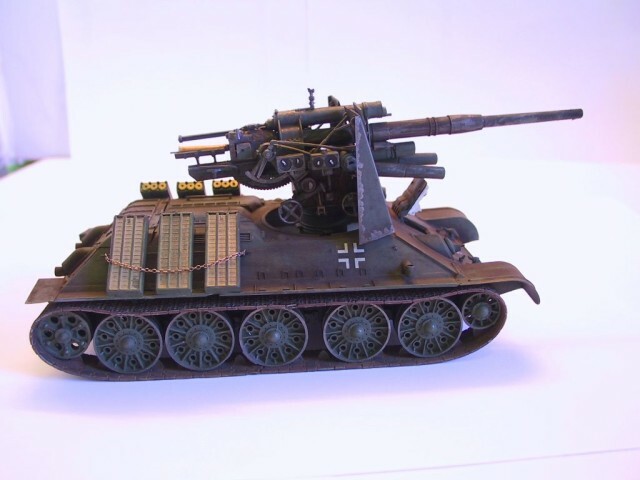 A model of the T-34(r) mit 8.8cm Flak by Henk of Holland. Similar to the above drawing, the Flak 88 in this model appears too low, and the crew would have to crouch down to operate certain controls. There also appears to be no space in which to carry munitions, and it is likely that it would need to tow a limber carrying munitions. 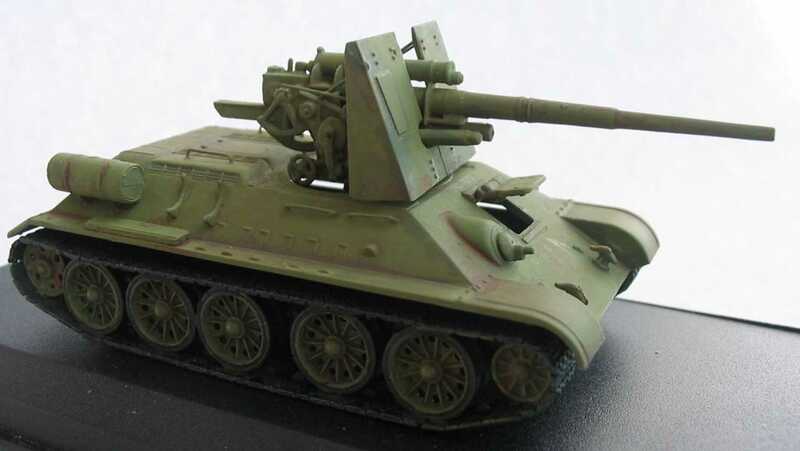 Another more detailed model of the T-34(r) mit 8.8cm Flak. It is likely that ammo would be stowed on deck, if this vehicle were real. Notice how the munitions are stacked right next to the engine compartment. If hit, the munitions might explode, thus causing a catastrophe for the vehicle and its crew. 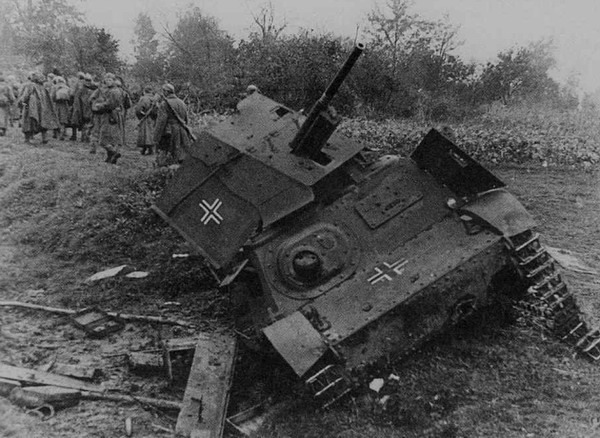 A knocked out beutepanzer Komsomolets featuring a 3.7cm Pak AT gun. This is a rare modification of the Komsomolets, and it is unclear how many were modified in this manner. They appear similar in design to the ZiS-30, which featured a large gunshield, too. However, this vehicle would be more stable than the ZiS-30, as the gun was not nearly as big. Perhaps this modification helped inspire the T-34(r) mit Flak 8.8cm. An Sd.Kfz 8 with a Flak 88. Notice how the Flak 88 is significantly taller than the ones seen on the models and drawings of the T-34(r). It weighed 22 tons, but had very limited armor – only 14.5mm at most. It was 24.1 foot long, 9.2 feet tall, and 8.7 feet wide. The gunshield limited traverse of the turret to 151 degrees either side. Only ten were made and three were lost by March 1943. These vehicles first saw action in Poland, 1939, but it was in the Battle of France, 1940, in which it performed both anti-bunker and AT duties. They excelled at both, being able to destroy even the heaviest tanks that the Allies could send at them – the Matilda and Char B1. Notice that there is rather limited space for the crew to operate on the deck, and the vehicle itself is huge, making it rather conspicuous. A Flak 88 mounted on a Panzer IV chassis. Notice how the hull is rather low. In fact, a new suspension layout was used in order to make the vehicle feasible, instead of just mounting a Flak 88 straight onto an unmodified Panzer IV chassis. A large superstructure has been added for stability and protection of the crew. The T-34 had 15 tons more load capacity than the Panzer IV, and it is possible that a Flak 88 would not stress the T-34 chassis as much. The Flak 88 was a mainstay of German AA defenses, although the overall effectiveness of AA guns was called into question during the war, thus raising the question as to whether or not all Flak 88s should be pressed into AT duties. An Egyptian T-34 with a 100mm BS-3 mounted in a new superstructure. 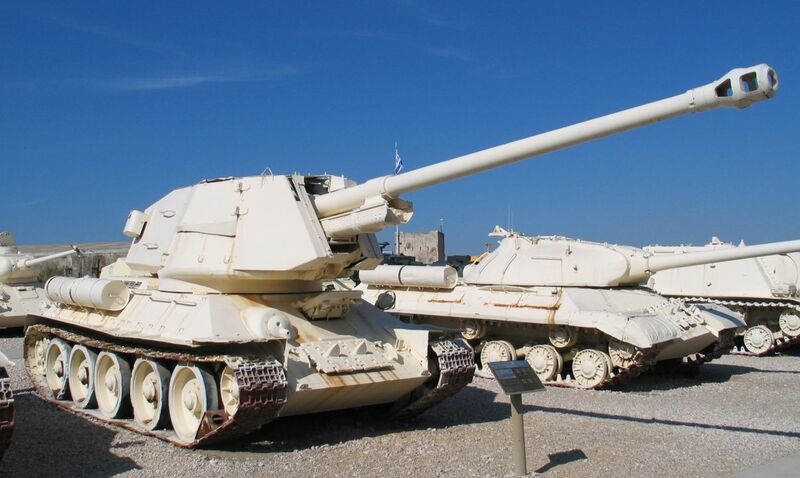 There was also reportedly a D-30 howitzer version featuring a very similar superstructure. The Egyptians were particularly inventive with their design, given that they were the only ones who modified the D-30 gun mounted inside an enclosed superstructure (notably larger than the T-34/85 turret). Enclosed superstructures can be cramped, and create significant weight problems – this T-100 (Egyptian designation) at Yad La-Shiryon Museum, Israel, is almost certainly dangerously nose heavy, and the chassis appears very low. This turret and gun still probably weigh less than the Flak 88, and still they stress the chassis. A Cuban T-34 with a 120mm D-30 gun mounted in a cutaway T-34/85. This modification proves that mounting a large gun on the T-34 is possible, but the BS-3 weighed less than half of the Flak 88 (in fact, roughly 4.1 tons less). The BS-3 and D-30 guns were widely exported by the USSR, and are a very common sight in armies, even today! By cutting away the turret, more space is given for the crew, and there is less weight and thus vehicle has less stress on the suspension. 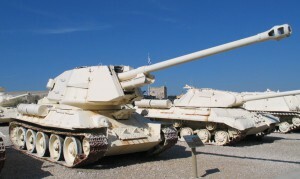 A Syrian modification of the T-34 to fit a 122mm D-30. Notice that they reversed the hull and fitted the gun on to the rear in order to avoid difficulty in creating a new turret or superstructure in which to house the gun. This means that the vehicle can maintain a very low profile, avoid weight problems and thus keep its maneuverability. A scale model of a T-34 with a Tiger’s 88mm gun and ammo basket mounted on it. This is one of many scale models as seen on the internet. This one shows it to feature a more common German green color, despite other sources referring to other colors. A KV-1 with a KwK 40 gun as seen at Kursk. 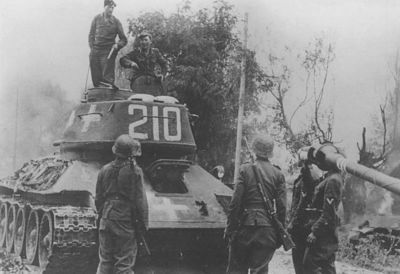 Conversions of guns onto captured vehicles appears to have been rare, this being the only known photograph of the modified KV-1. 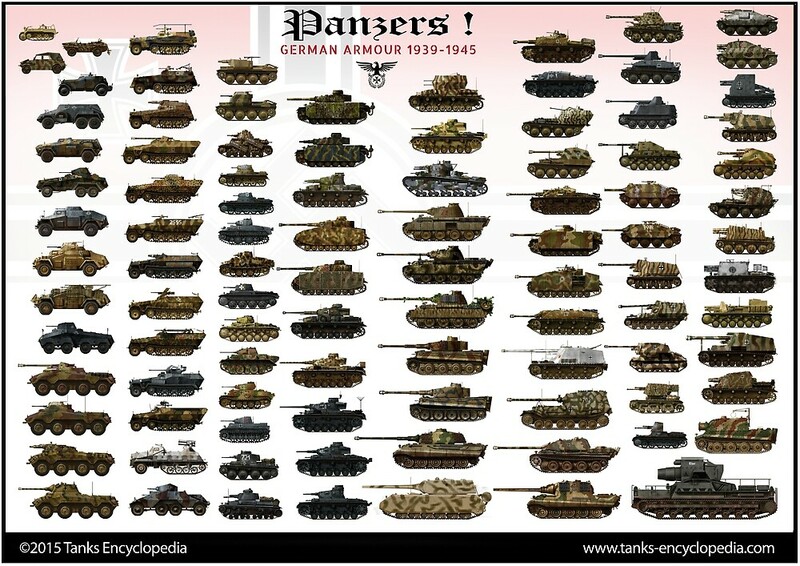 The monumental task of mounting a German gun onto a Soviet tank would be staggering, but it is more than possible. Perhaps Kloth meant the soviet 85mm commonly found on the T-34/85. It is not unusual for veterans to mistake weapons’ names and calibres. After all, they didn’t care much about those things. I recall Koschorrek calling the PPSh-41 submachine-gun, “Kalashnikov” in his book. You’re absolutely right, and there wasn’t much doubt that Kloth did mean 85mm, but the point is that he’s the only guy who mentions this vehicle, and he only really says it in passing. He did serve at Kurland, but he doesn’t say much more to give his claim more weight. If he said “I commanded it”, “I helped convert it”, or “I personally saw it in action”, then he’d be more credible. For now, it’s likely that it was just a small wartime rumour in that particular area. They might have tried to do it, but the chances of it working are slim. Captured Soviet 85mm AA guns were relined to 88mm caliber – see: http://www.jaegerplatoon.net/AA_GUNS3.htm, so it would be possible to have T-34/88(r). After some further research, it seems that you’re right – they Finnish did do this, but it seems that the Germans didn’t. So that means it’s possible for 85mm guns to fire an 88mm shell, if properly done. However, I will note that the Soviet 85mm D-5T or more likely S-53 gun was different to standard AA guns. In fact, they were usually simplified (and in the case of the S-53, it was a huge simplification), although derived from 85mm AA guns. However, with these simplifications comes a difference in that they were specifically designed for tanks, so the process of relining (or reaming) might have worked slightly differently than done on the AA guns. I’d need more information on that process. Let’s assume that it can be done. Now the thing to consider is that the gun is mounted inside a tank, so they’d have to remove it from the mount and reline it. That seems easily done in a factory / designated repair station, and it’s more than possible in the field, but the T-34/88(r) was in Kurland, where Kloth says that their “backs were up against the water”, so all I wonder is whether or not it was possible specifically at Kurland. That’s great info, though, i’ll add it to the article as soon as I can. This is were I have a ‘Senior Moment. Every time you fire the gun, the shell shaves metal out of the barrel until it said to be ‘Shot Out’, the barrel would only have so many lives. If you took an 85mm barrel (from a T34/85) that had been ‘shot out’, most of the ‘reaming’ would have been done for you. The next step would be to check the barrel is true and has not been distorted through its length (not bent through heat and wind). Is it worth machining to re chamber the ‘breech’ end of the barrel to accept 88mm shell cases (they could be longer, if it is you would loose some of the rifleling or the case maybe slimmer, which would mean ‘sleeving’ the chamber). the same, so would need to adapt the sights/range drum from the donner tank. There would be issue with casing fitting chamber. That AT gun mounted on Komsomolets is a Soviet 45 mm M1937 AT gun ,not German 37 mm one. But anyway, great article. I’m afraid to say that the gun is actually a 3.7cm Pak 36 gun. The original picture only supplied the soldier standing in front and the background, that is a different t-34, it does not have the cross on the hull, there are spare track links on the hull, the stuff on the left side of the hull is gone in the shopped one, and the drivers hatch is closed. The soldiers in front of the vehicle are perfectly identical. Same pose, same insignias. The trees in the background are perfectly identical. The two vehicles are at exactly the same angle with respect to the camera. Sorry to disappoint you, but it is a photoshopped image. A well photoshopped image, but photoshopped nonetheless. The FlaK 36/37 8.8cm was the first gun to use as Air Burst Ammo. they set the Timefuse to 200m+ and let is detonate in the high 20/30m over the soldiers. Spezial when they must come over a brigde or over a River this was a nasty Weapon. With prepadred Defence Parameter it was an effective weapon on Softtargets. Common was 800m to give an reactiontime to flee and fight a other Day. When you use it in Batteries it was a mass for the Infantry. Notice how the hatch is open in the photoshop and closed in the real photo? Why was this overlooked? Would it be feasible to mate the projectile from a German 88 onto the case of a Soviet 85? I know the US put German projectiles onto American 75 casings. Sure, both were 75mm, but it proves that the idea was around and there was benefit to doing so. From what I remember, the Soviets used APBC ammo, where as the Germans used APCBC-HE, which was vastly superior in terms of destructive ability, thanks to the bursting charge. To up the lethality of the Soviet 85mm of what ever flavor were on those tanks, you could ream the vote out the extra 3mm and replace the projectiles with German 88mm (though this would be a bit more complicated that just swapping from same sized guns). This way, chamber and beach block remain entirely unchanged. Doing a bit of research, I found the PzGr39 (APCBC-HE-T) to be 6.8kg and the BR-365 (APBC) to be 9.2kg. This means that, at least theoretically, barrel pressure shouldn’t be an issue. Does this at least sound plausible?